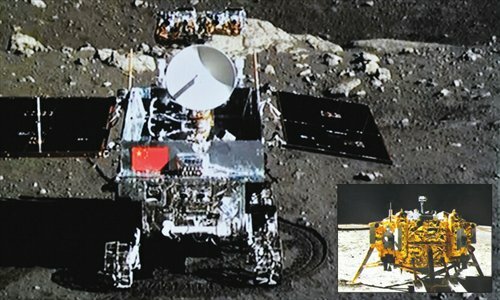 The Chang'e-3 probe and its moon rover separated before taking photos of each other on the moon's surface on Sunday, marking a "complete success" of the Chang'e-3 mission, Ma Xingrui, chief commander of the lunar program, announced on Sunday night. The moon rover, Yutu, took photos with a panoramic camera at five points at a distance of 10 meters when moving around the probe, while the probe also took pictures of the rover with its landform camera and then sent them back to Earth, said Sun Zezhou, chief designer of the lunar probe. The pictures of the moon's landscape and the probe and rover on it, carrying China's national flag, mark the country's first soft-landing on the surface of an extraterrestrial body. Yutu, which traveled at 200 meters per hour, will start a three-month research mission on the moon, examining the moon's soil construction, landform and material composition, according to the State Administration of Science, Technology and Industry for National Defense. Yutu was deployed from the probe and tracked on the moon's surface at around 4:45 am on Sunday, approximately seven and half hours after the successful soft-landing of the probe. China became the third country to do so after the US and Soviet Union. The last such mission was made by the Soviet Union in 1976. The probe touched down on an area named Sinus Iridum, or the Bay of Rainbows, as planned. The landing process started at 9 pm on Saturday and lasted for about 12 minutes, according to China Central Television's live broadcast. Chang'e-3's landing is the second step of the three key stages of China's lunar program. The third step will involve bringing samples back to Earth for closer analysis. News of the landing quickly made an impact on China's hugely popular social media, topping the list of searched items, as many commented in the style of the famous Neil Armstrong remark, "one giant leap for mankind." The successful soft-landing of Chang'e-3 attracted the world's attention, as some scientists compared China's interest in the moon to that of many other countries in exploiting resources in Antarctica, saying such scenarios depend "entirely on the business case," the AFP reported. Jiao Weixin, a professor at the School of Earth and Space Sciences, Peking University, told the Global Times on Sunday that the lunar program mainly focuses on its scientific purpose rather than the economic purpose, which Western media reported. Although the moon may have rich mineral and energy resources, such as helium-3, and China's moon research did include examining such resources, "it is still unrealistic for any country to profit from the moon's resources in the near future considering the technology and cost," he said. However, Jiao didn't rule out the possibility of developing moon resources in the future, which should be "many" years away. During the online interview on the program's official Weibo account, Liu Jianzhong, a research fellow from the Institute of Geochemistry with the Chinese Academy of Sciences, told Net users that whoever is capable of developing the moon's resources first should reap the benefits. President Xi Jinping and Premier Li Keqiang watched the spacecraft take pictures of each other, and congratulated the success of the Chang'e-3 mission. Q: Is Chang'e-3 going to take photos of our beautiful Mother Earth? A: If conditions are right, it is likely to do so. Q: Is the rover going to bring back soil samples from the moon? A: Not this time. It will happen in the third stage of our moon missions. Q: Why not design a return mission first rather than waste resources on several missions? A: It's a complicated technical challenge, and each mission paves way for the next step. Q: How long is Yutu going to work this time? A: The planned working life of Yutu is three months. Q: Can Yutu take 3D pictures? A: Yes, Yutu has panoramic cameras, which can mimic human eyes and take 3D pictures.